Let "Fish Bait" be your home away from home as you enjoy the sugary white sands of Navarre Beach. This cozy, coastal condo is located in the west tower of the Summerwind resort on the 6th floor. This unit features 2 bedrooms, and 2 bathrooms along with a "bunk room" which has a twin over double bunk bed, The master bedroom features a King Bed while the guest room features 2 fulls. There is also a sofa sleeper in the living room which makes this unit comfortably sleep 9. Enjoy your morning coffee or an evening cocktail on your private balcony viewing the crystal clear water of the Gulf or looking down onto the pier. This unit has many amenities included: a washer and dryer, WiFi, and a fully equipped kitchen with granite countertops. Perfect for families or parties traveling together. 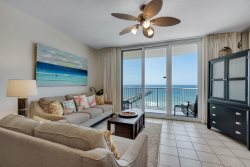 If you are looking to get your toes in the sand and relax in a beachfront condo with all of the comforts of home, look no further than Summerwind 602 W.
Always have a great time at Summerwind and always look forward to returning.